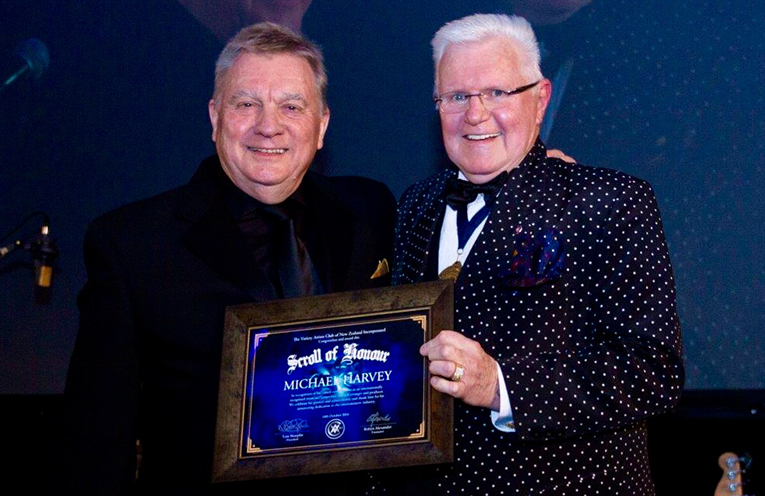 Michael Harvey (LEFT) receiving the Variety Artists Club (VAC) Scroll of Honour, with VAC Patron, David Hartnell MNZM. TEA Garden’s Michael Harvey, well-known as one of Australia and New Zealand’s most successful and accomplished Composers and Musical Directors has been honoured by the Variety Artists Club of New Zealand. The coveted Scroll of Honour was presented to Michael at a recent star-studded event held in Auckland, New Zealand. The Scroll of Honour is in recognition of Michael’s valued contributions as an internationally recognised musician, songwriter, musical arranger, and producer. The Scroll of Honour celebrates Michael’s passion, achievements and his unwavering dedication to the entertainment industry. Throughout a career spanning 40 years, Michael has been the recipient of many entertainment awards which include: ‘’The Grand Prix” in the Pacific Song Contest (Canada), the “Outstanding Song Award” in the Yamaha Song Festival (Tokyo), the “APRA Silver Scroll” (twice) for Best Song Composition, an “International Gold CLIO” (New York) for Best Music Soundtrack for a television commercial – the accolades go on! The prestigious Variety Artist Club Scroll of Honour is a career highlight. Michael has been Musical Director for many of Australia and New Zealand’s renowned entertainers including Julie Anthony, John Rowles, Rob Guest, The Seekers and Kamahl. Michael has accompanied international stars such as Neil Sedaka, Cleo Laine and was the conductor for the original boy from Oz himself, Peter Allen. The musical directing talent of Michael Harvey was enjoyed by Australian television audiences at Christmas (from 1995 to 2006) when listening to ‘’Carols in the Domain’’. Michael was guest Musical Director on the television show “Midday with Kerri-Anne”. The West Australian Symphony Orchestra, the Sydney Youth Orchestra and members of the New Zealand Symphony Orchestra, have performed in concert under the direction of Michael Harvey. The moving version of the Australian National Anthem, ‘’Advance Australia Fair’’, sung by Julie Anthony and orchestrated by Tommy Tycho was produced by Michael Harvey. Michael has been a lecturer and tutor in Performing Arts, Piano, Composition and Songwriting where his pupils included Delta Goodrem and Natalie Bassingthwaighte. Michael and his wife Jill, (herself an accomplished entertainer) are continuing to share their passion for music to sell-out concerts that range from the classics to jazz. Audiences are drawn into the passion and talent that is maestro Michael Harvey. The Scroll of Honour says it all – Thank you for the music!